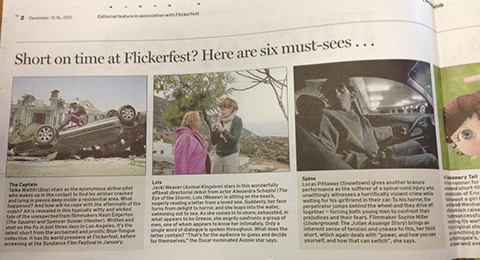 Spine has been picked as one of the six must-sees of Flickerfest in the Sydney Morning Herald! Spine will be showing at Flickerfest on Monday 14th January at 9pm and Thursday 17th January at 4:30pm. This entry was posted in News on December 15, 2012 by admin.